Myanmar’s government has signed on October 15 what it says is a nationwide ceasefire deal with eight armed ethnic groups. 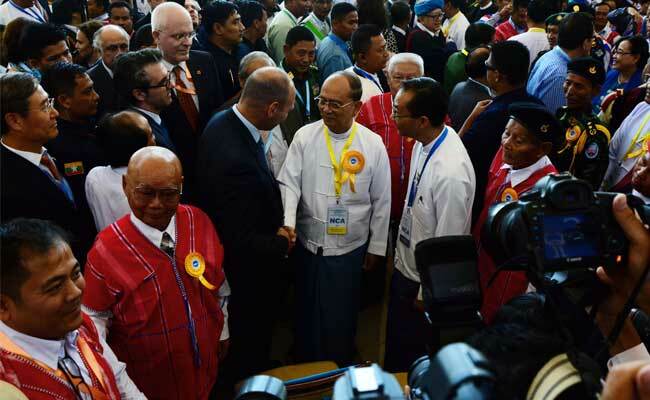 The signing ceremony in Myanmar’s capital, Nay Pyi Taw, was the culmination of two years of peace talks. However, the most active rebel groups – seven of the 15 groups involved in negotiations – stayed out of the deal. The government hopes today’s deal will be the first step on a path to a lasting political settlement. Political discussions are now due to begin within months on the structure of a new, and likely more federal, system of government. However, there are still concerns that peace with the groups signing the agreement could be short lived, if the Burmese army ignores the ceasefire, as it has with others. Earlier this week, all of the groups signing were removed from the government’s list of “unlawful associations”, a step towards bringing them into mainstream politics. The Karen National Liberation Army (KNLA) Peace Council, the Arakan Liberation Party (ALP), the Chin National Front (CNF), the Pa-O National Liberation Organization (PNLO), and the Democratic Karen Benevolent Army (DKBA) were removed from the list on October 13. They joined three other armed groups removed on October 12: the All Burma Students’ Democratic Front (ABSDF), the Restoration Council of Shan State (RCSS), and the Karen National Union (KNU) – Myanmar’s oldest armed group, which has been fighting for nearly seven decades. The seven groups which have not signed are not far behind, and have agreed a draft deal, negotiators said. Many of Myanmar’s ethnic minority groups have long demanded greater autonomy, or outright independence, from central government, which is dominated by the Burmese majority. Opposition leader Aung San Suu Kyi, who has previously urged rebel groups to focus more on a lasting deal than a quick one, was not at the signing ceremony. State media had reported that representatives from the European Union, India, China, Japan, and the United Nations would be at the signing.